I can’t, unlike some reviewers, coin phrases “is it really that long since…” and “it only seems like yesterday…” because Yellow Submarine, in all its meticulously hand drawn pop art meets surrealism glory, is of the same vintage as me. The Beatles attended the films premiere on July 18, 1968, the day I was born. Although I can’t pretend to have been there right at the beginning, I have grown up loving the film through television screenings and video and DVD releases. I never dreamed that one day would get to experience the magic of Yellow Submarine on cinema screen. After all, that was an experience reserved for those who caught the film at the cinema back in 1968, right? Wrong! Cardiff’s Tramshed, equipped with 46 vintage passenger seats from a first-class British Airways cabin and a screen sized 5259mm x 2501mm was the ideal venue to enjoy the film on its 50th anniversary. Welcoming and friendly staff ushered film goers in and ensured we were all sitting comfortably prior to our Fab Four film experience. 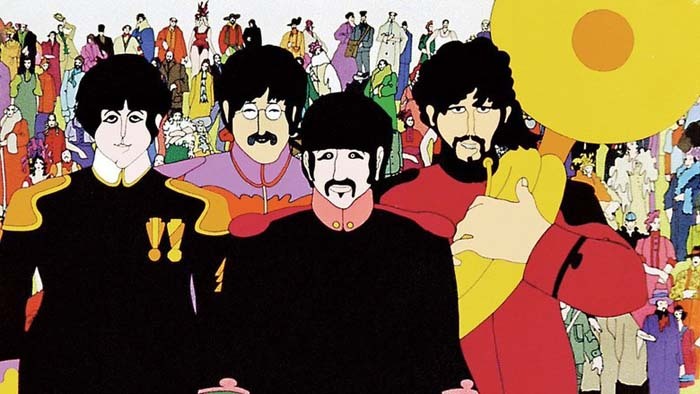 The Beatles as they appear in the 1968 animation, Yellow Submarine, which was screened by The Tramshed cinema in Cardiff as part of the film's 50th anniversary celebrations. Based around the 1966 John Lennon and Paul McCartney composition, Yellow Submarine, Lee Mintoff’s script follows the events of a Blue Meanie attack on the undersea world of Pepperland. The one remaining escapee of the attack, Fred, boards the Yellow Submarine to bring back The Beatles to defeat the meanies through their message of music, peace and love. Many wonderful and strange lands are encountered in the process through the medium of pop art, surrealism and a selection of Beatles songs including Lennon & McCartney’s All Together Now and Hey Bulldog and George Harrison’s It’s All Too Much and Only A Northern Song. The 50th anniversary print of Yellow Submarine has undergone a frame by frame clean up by hand (not through computer techniques). It remains a far cry from the forced tidiness of the latest Dreamworks or Disney blockbusters and is still a celebration of styles and mediums. Visually, the film might appear to be primitive compared to some of the computer-generated titles produced today, but in many ways Yellow Submarine remains fresh, exciting and artistically interesting. Its incredible to think that director George Dunning only had 11 months to complete the film and had to quadruple his staff to ensure each frame was drawn and subsequently hand painted to deadline. Few animations jump so freely from one artistic style to another. The combination of pop art and film for Only A Northern Song is still mesmerising, while there’s a wondrous childlike simplicity to the watercolour expressionism of Lucy In The Sky with Diamonds. Collage dominates Eleanor Rigby to maximum effect while Psychedelia brings a new dimension to cartoons in Nowhere Man. Although The Beatles themselves had little to do with Yellow Submarine apart from contributing music and briefly appearing at the film’s climax, (their voices were provided by actors) it remains one of their most memorable projects. On a personal level, Yellow Submarine never fails to surprise me and even after my life long appreciation of the film there are still new things to see with this presentation. The sharpness and clarity were particularly there to add further depth to scenes and I even noticed more detail in certain scenes than before. A must-see event, don’t miss out on this rare opportunity to see one of the most influential animations ever made and an opportunity to hear a fabulous Beatle soundtrack remixed to perfection. Yellow Submarine gets a further screening at The Tramshed cinema on August 16 at 7pm. For details on this and other film screenings visit The Tramshed cinema website.